After hours in the halls of Newberg High on Feb. 1, dozens of people filed through the dimly lit area toward a vibrant space near the cafeteria. As they trickled in, the crowd – consisting of former athletes, coaches and their families – grew in size and filled the empty side of the school with the sound of conversation. Former NHS javelin coach Joe Boutin was one of the last to arrive, along with his wife Jan. The pair are fixtures in NHS sports history and each of them drew hugs and greetings from Boutin's former coaching compatriots and athletes – some of whom went on to achieve greatness. Much of that greatness can be attributed to Boutin, many of them admitted. 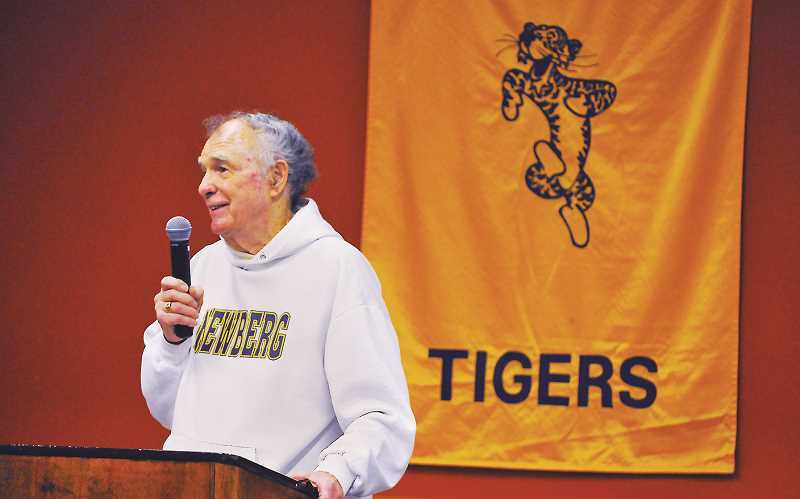 After 37 years at Newberg High that included 12 state champions and three Olympians, Boutin retired from coaching last year and handed the reigns to Sarah Malone – one of his former champions. Malone invited many of the people whose lives were touched by Boutin to the event, where she presented Boutin with a bench in his honor and opened the floor to stories about his historic coaching career. "When he officially retired I was kind of waiting for him to get out of here so I could have a coaching job," Malone joked, smiling while holding back tears. "Once that happened and he decided to step away, he did it very quietly, and it just didn't feel right. I reached out to the folks I had connections with and put this together." Boutin's success speaks for itself, but the impact he had on the lives of every person who attended the event was evident. Everyone seemed to have a Joe Boutin story and the room would light up when someone chose to tell their own. Rachel Yurkovich graduated from Newberg High in 2005. After setting the national record during high school, she went on to throw the javelin at the University of Oregon and competed in the 2012 Olympics. She is one of three Olympians that Boutin coached. "He's like my family," Yurkovich said. "He paved the way for so many people and that's exactly what he did for me. Coach taught us what it means to be a great athlete in your sport and how you carry yourself outside of it." Jason Lile felt Boutin's influence more than most. Like Boutin, Lile joined the Marines after high school and ended up throwing the javelin for their track and field team. Coach Boutin's ability to motivate him and get the best out of his athletes is what stands out to Lile, along with the sheer number of people who went to college that competed for Boutin. Lile looked around the room of people, which included multiple generations of athletes whose lives were changed by Boutin, and expressed his gratitude. "He knows how to seek out a competitor," Lile said. "He knows what to say to you to piss you off enough to motivate you. He's a great guy, great coach and he left an impact on me." Through multiple speeches by state champions and rival coaches alike, Boutin sat at his wife's side and held her hand. 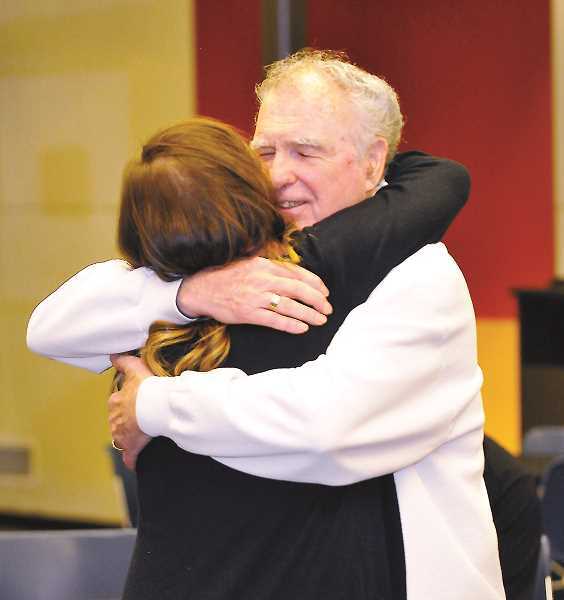 When it was finally his turn to speak, he thanked her first – both for her support throughout his coaching career and her willingness to let it last as long as it did. He always needed Jan's permission to return for one more year, he said, and she was always there to provide support to him. Boutin spoke for more than 30 minutes after acknowledging Jan's contribution, and he spent less than 30 seconds of it talking about himself. Instead, Boutin spoke about all of the athletes in the room along with many who weren't able to make it. Some traveled from out of state to be in Newberg for their coach, and he did nothing but lavish praise on their successes – whether that be at the high school, collegiate or Olympic levels. Boutin recalled many of the javelin records and winning throws without even a glance at his notes. It was the mark of a great teacher – the ability to look back on nearly 40 years of coaching and remember so many of the faces, personalities and stories. In the end, they are his legacy. "I've been blessed to coach some great athletes and great people," Boutin said in his speech. "I always told my athletes it's not about if you win, but how you win, and I'm very proud of how all of you won."